The double bottom is a major reversal STOCK pattern that forms after an extended downtrend. The pattern is made up of two consecutive troughs that are roughly equal, with a moderate peak in-between. Double-bottom patterns usually marks an intermediate or long-term change in trend. Until key resistance is broken, a reversal cannot be confirmed. For further in-depth information on stock market charts and stock chart patterns, check out this resource, which contains critical information to help you learn to use stock charts and technical indicators in a clear, simple and concise manner to improve your stock trading entries and exits. Prior Trend: With any reversal pattern, there must be an existing trend to reverse. In the case of the double-bottom, a significant downtrend of several months should be in place. First Trough: The first trough should mark the lowest point of the current trend. The first trough is fairly normal in appearance and the downtrend remains firmly in place. Peak: After the first trough, an advance takes place that typically ranges from 10 to 20%. Volume on the advance from the first trough is usually not important, but an increase could signal early share accumulation. Second Trough: The decline off the reaction high usually occurs with low volume and meets support from the previous low. Even after establishing support, only the possibility of a double bottom exists, it still needs to be confirmed. The time period between troughs can vary from a few weeks to many months, with the norm being 1-3 months. While exact troughs are preferable, there is some room to maneuver and usually a trough within 3% of the previous is considered valid. 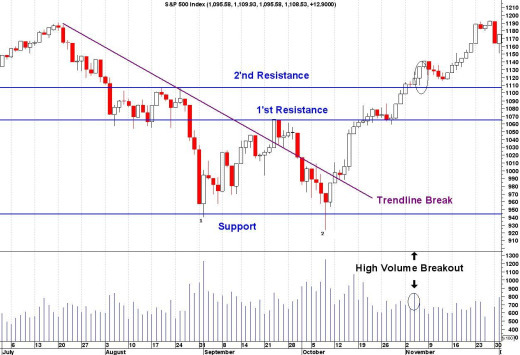 Advance from Trough: Volume is more important for the double bottom than the double top. There should clear evidence that volume and buying pressure are accelerating during the advance off of the second trough. Resistance Break: Even after trading up to resistance, the double top and trend reversal are still not complete. Breaking resistance from the highest point between the troughs completes the double bottom. This should occur with a large increase in volume. The OBV Indicator can be used to confirm the break. Resistance Turned Support: Broken resistance becomes potential support and there is sometimes a test of this newfound support level with the first correction down. Such a test can offer a second chance to close a short position or initiate a long sale. Price Target: The distance from the resistance breakout to trough lows can be added on top of the resistance break to estimate a target. This would mean that the bigger the formation is, the larger the potential advance. It is important to remember that the double bottom is an intermediate to long-term reversal pattern that will not form in a few days. Even though formation in a few weeks is possible, it is preferable to have at least 4 weeks between lows. Bottoms usually take longer than tops to form and patience can often be a virtue. Give the pattern time to develop and look for the proper clues. The advance off of the first trough should be 10-20%. Volume indicators such as OBV can be used to look for signs of buying pressure. Just as with the double top, it is paramount to wait for the resistance breakout. The formation is not complete until the previous reaction high is taken out. In-depth Chart Pattern Training Course! Learn How to Predict the Performance of a Chart Pattern! Return from "Double-Bottom" to the Home Page: "Stock Market For Beginners"